I’m glad Avatar did not win the Academy Award for Best Picture this Sunday, and not just because it was over-hyped. The Hurt Locker was genuinely a much better film. I’ve seen many, many war films and The Hurt Locker was unlike any other. It portrayed a type of soldier that I did not know even existed, but, after seeing the movie, seems very real now. The Hurt Locker is about about a specialist in a U.S. Army Explosive Ordinance Disposal (EOD) team whose personal reasons for fighting in the Iraq War have nothing to do with patriotism, financial need, or even supporting his fellow soldiers. SFC William James is in Iraq because he is addicted to the adrenaline high of high-intensity combat. The Hurt Locker opens with a quote by a New York Times war correspondent that summarizes the theme of the movie: “The rush of battle is a potent and often lethal addiction, for war is a drug.” For this unique portrayal of war, I think The Hurt Locker deserved all of the Oscars it received. 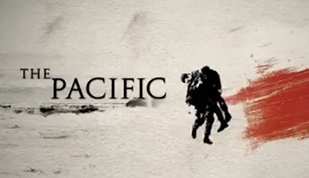 On another note, I am excited to watch the upcoming HBO miniseries The Pacific. Like the film Saving Private Ryan (1998) and the miniseries Band of Brothers (2001), this is another collaboration by Steven Spielberg and Tom Hanks portraying American soldiers during World War II, this time in the campaign against Japan. I am most curious about from what angle Spielberg and Hanks will approach this series to make it different from the others. Spielberg is such a great artist and storyteller, in my opinion, that this won’t just be “another war film”. Saving Private Ryan is a monumental film – it’s an icon of the horrific events of D-Day, June 6, 1944, in the imagination of a younger generation of Americans. Band of Brothers is also unique in that it follows a single unit of American paratroopers throughout their combat experiences during the entire war, but in a style similar to another HBO series, The Sopranos, where each episode focuses on a different character to create a portrait of the entire group. What will The Pacific be like? I’m eager to find out (the first episode premieres on Sunday, March 14 at 8p CST on HBO). On a final note, Christoph Waltz, who won the Oscar for Best Actor in a Supporting Role this year for portraying a Nazi “Jew Hunter” in Inglorious Basterds, performed one of the best feats of acting I have ever seen. If you haven’t seen this movie, go see it if for nothing other than to watch Christoph Waltz portray Standartenführer Hans Landa, whom director Quentin Tarantino described as “one of the best characters I’ve ever written and ever will write”. Christopher Waltz performance made Inglorious Basterds. Notice that in all his shots there is great tension. Superb Actor! I thought the scene in the restaurant with Christopher Waltz and the girl was brilliant. So much tension – Tarantino is a master.